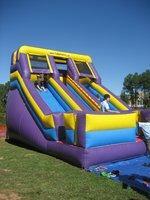 Moonwalk Rentals in Atlanta with Jumptastic! 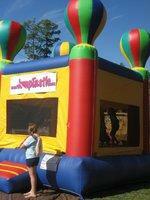 Moonwalk Rentals Atlanta with Jumptastic are perfect for any Children's Party or Event. No Event too Large, No Party too Small!! Call 404-537-1805 today for the best selection or you can reserve your inflatable fun online 24/7. Simply click to enter the date of your event or party in the event calendar to begin. Jumptastic is a family-owned company that has been providing the newest and most popular moonwalk rentals and other inflatable rides and games since 2000. Our primary concern is safety and your total satisfaction from reservation through the end of your event. Jumptastic has everything you need to ensure your celebration is a success. We rent inflatable moonwalks in Atlanta and nearby cities. Standard and Deluxe Moonwalks of all sizes: Along with a selection of colorful and fun moonwalk rentals and bounce house rentals, we have a large selection of themed and licensed moonwalk jumpers. Disney Characters, Mickey Mouse, Hello Kitty, Birthday Cakes, Superheroes, Castles, Princesses, Pirates and more can be found amongst our inventory. Moonwalk rentals are perfect for any type of Atlanta party or event and a great form of active entertainment for all kids. Combination Moonwalks with Jump, Climb, Slides, Hoops and More: If you're looking for more from your inflatable moonwalk rental than just a bouncing area, we offer a wide variety of themed, licensed, and colorful moonwalks with additional features including wet/dry slides, basketball hoops, single and double lane slides, pop-up obstacles and more. Combination Moonwalks are perfect for longer Atlanta parties and events and for children whom seek more adventure in their entertainment. Moonwalk Slides: Whether your party or event guests are large or small, everyone loves the thrill of zooming down a slide. With over 40 slides to choose from, you're sure to find one that fits your budget and expectations. Slides are wonderful additions to Atlanta parties and events with extremely active kids, where more activity is desired, there are a greater number of guests or a wide variety of ages are expected. Inflatable Interactive & Sports Games: Our Inflatable Games provide a truly unique experience for guests of all ages. Competition, Action, and Memories are trademark phrases for events including these amazing interactive moonwalks. Our Four Player Wrecking Ball, Velcro Wall, Basketball Games, Football Games, SOccer Games, Boxing Ring, Bungee Run and many other choices will be fun for all ages and a great crowd pleaser at bigger events and are wonderful for fundraisers as well. Authentic Carnival Concessions and Catering Equipment & Supplies: Popcorn Machine Rental, Cotton Candy Machine Rental, Hot Dog Cooker Rental, Snow Cone Machine Rental, Frozen Drink Machine Rental with all supplies for 10 or 1,000s. We routinely replace our equipment to ensure they are dependable, safe and easy to use. Party supplies, Decorations, Party Favors, Prizes: Decorations can make or break an event -- at the very least, they set the tone and mood for the atmosphere surrounding your party. Click here to go to our online store and get these items delivered directly to your door. Check out our Rentals Page for a complete list of our rental inventory. 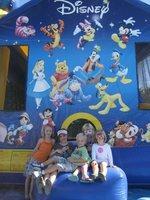 Why Rent Inflatables From Us? Safety, quality and overall experience. 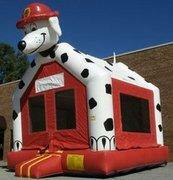 We offer one of the largest selections of inflatable rides and games inventories in the Southeast. We continually add new units and remove older units to ensure we have the safest and most popular rides and games for your party, festival or event. Our moonwalks are full cleaned and inspected prior to each and every rental. Please check out our FAQ Page and our Testimonials and Reviews for more information. Jumptastic delivers to Atlanta Area Festivals, Events, and Parties and most locations in Northern Georgia, including Children’s Birthday Parties, Summer Camps, Daycares, Churches and School Carnivals. A nominal mileage fee may apply. Click here for a complete mileage fee chart. Our Large Event Service Area covers most of Georgia and the Atlanta Metro Area including: Forsyth County, Hall County, Gwinnett County, Fulton County, Dekalb County, Cobb County and other surrounding counties. Call 404-537-1805 for information on our Festival and Large Event solutions.